new Tai Chi class at Yoga centre Brewers quay weymouth. starts Monday 9th Sept 2.00 pm. suitable for almost anyone at any age. a great form of exercise to build strength, stamina, and learn to move in a relaxed way leading yo a calmer mind. ideal exercise to help deal with the stress modern living places on us all. So why not come along and give it a try. come along to the open evening Friday 21st at brewers quay, look for the sign to the left of the main entrance. 6.30 till 8.30. pm. Meet Sarah yoga teacher and reiki master, have a cuppa look around the new venue. there will be a children’s yoga class. I will be there to promote a new Tai Chi class and will be doing FREE seated chair massage for the first hour. please like and share and do come along. The carers day at Dorchester day care centre went fantastically. lots of people came to the event. Which was a day of therapies designed to help people who care for others relax and take time for themselves. we had guided meditation lead by Sarah Bradshaw. Reflexology from Helen Rigler, and I was there doing seated chair massage and Chi Kung. there were stands explaining memory loss and much more besides. Everyone had a great time and it was all very enjoyable. a free lunch was provided with added info about healthy eating. Thank you Marianne for making it such a brilliant event. A free session of Tai chi. The perfect chance to come along and have a try at this wonderful art. Time 9.45am date 15th April at the yoga centre above Julia’s house charity shop in St Marys street weymouth. new date for Tai chi at Burraton spa complex. A new beginners class will be starting on Friday the 10th of May at 2.00pm everyone is welcome, so if you would like too learn to meditate, improve your physical condition and cultivate your Chi (life energy) sign up for the class now. either email me or pop into the spa on poundbury and sign up there. places are limited and this is likely to be the only new class during the day I will be teaching. I will be starting a new Tai Chi class Friday the 11 of January at 2pm. The venue for this new class is the Burraton spa poundbury Dorchester. This will be a beginners class suitable for any age group, You will learn the short Yang style Tai Chi Form one of the most well known styles of Tai Chi. For more info about Tai chi please check my website where you will find much more detail about what Tai Chi practice can do for you. www.holistichealth-weymouth.com also check out the Burraton spa website they offer so much from kung Fu through to massage, tanning, beauty therapy, you can even get married there. Today 10.00am at Redlands sports centre. The first class at the new venue. so if you would like to learn this thousands of years old art of health improvement and meditation through the breath, please come along. classes last one hour. possible benifits with regular practice include a lowing of stress levels, increased flexability and stamina,a general improvement in strength and energy levels. cost £6.00 pay on the day. Talking stones workshop held over two consecutive saturdays 10am until 3pm starting on the 8th of September. 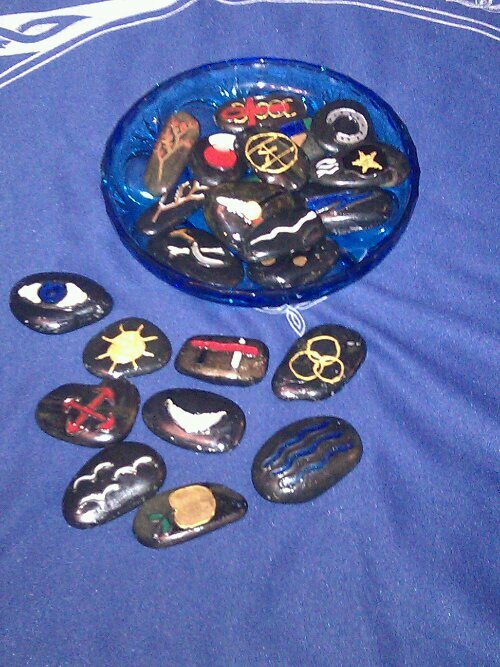 you will make your own set of stones on the first saturday (all materials provided) on the second saturday you will learn to use the stones for divination, on this fascinating journey you will bring the past into the present and learn too divine the future. Garry’s Tai Chi class is a really soothing antidote to a stressful day’s work. Tai Chi’s not easy to learn but Garry puts it across well. He’s great at spotting as soon as we start to struggle and goes at just the right pace so everyone can follow. Unwind, exercise and have fun all at the same time – can’t be bad!